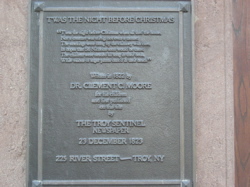 The classic poem "A Visit from St. Nicholas" appeared in the Troy Sentinel in 1823. That much, people agree on. There's a plaque and everything. As for the poem's author... that's a matter of long-running dispute. So, how to settle this situation? How about a trial. 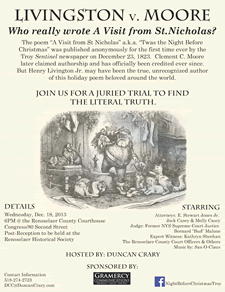 On December 18 there will be a mock trial of the case in an actual court room at the Rensselaer County Courthouse with an actual (retired) judge and actual attorneys. It's organized by Duncan Crary, because of course it is. Here's more about the trial via Paul Grondahl. Heading up the argument for Clement C. Moore, who has traditionally been credited with the poem: E. Stewart Jones. Heading up argument for Henry Livingston, Jr, who claims to have written the poem 15 years before it was published: Jack Casey. Hearing the case: Retired state Supreme Court Justice Bud Malone. Among the expert witnesses to be called: Rensselaer County historian Kathryn Sheehan. The trial is at 6 pm on December 18 at the county court house. It's open to the public. There will be a reception at the Rensselaer County Historical Society afterward. The arguments: Here's a quick overview of the two competing claims from Mental Floss.